Are these the ‘light-up’ type of headphones? Yes, they are. Both Ear Cups are illuminated by bright LED’s. They show green, red, or blue depending upon which of their three channels are activated. What controls are on each headphone? What is the reception distance for the headphones? Under optimum circumstances the reception distance is 300 yards. That is three football fields. Also, because these use FM signals, they work through obstacles like walls. It doesn’t have to be line of sight. What if I can’t get the music loud enough in the headphones? But your first step is to talk to the person playing the music. Tell them to read my FAQ. Then they will know that their player devices should be turned all the way up – both the hardware and the software. If it is a DJ mixer board, that doesn’t need to be turned all of the way up, but it still does need to be turned up higher than they have it. Make sure the DJ only has her Silent Disco headphones only turned up to about 60%. If she has hers on 100%, she is going to be playing the source music too soft. What are your headphone specs? No, you can’t change the batteries. They are rechargeable lithium-Ion Batteries that are hardwired in. They come to you fully charged so you don’t have to charge them unless your party is longer than ten hours. They have proprietary charging ports so you can’t recharge them without our chargers. We do send you some chargers in case you need them. How do I recharge the headphone batteries? You won’t need to recharge the headphone batteries unless your party is longer than ten hours. However, we do include a battery charger for multiple headsets when we send them to you. They are in the zipper pocket on the outside of the transmitter case. You plug the charger into the wall, connect the charger cord and plug in the headphone. It will glow red while it is charging and green when it is done. Are Silent Disco Headphones Sanitary? We wipe down each headphone with sanitary wipes after each use. Additionally, they are made of synthetic material which by nature is not conducive to bacterial growth. Do the headphones work with Bluetooth? No, These headphones use an FM style signal on their own unique frequency. This is completely different than Bluetooth. 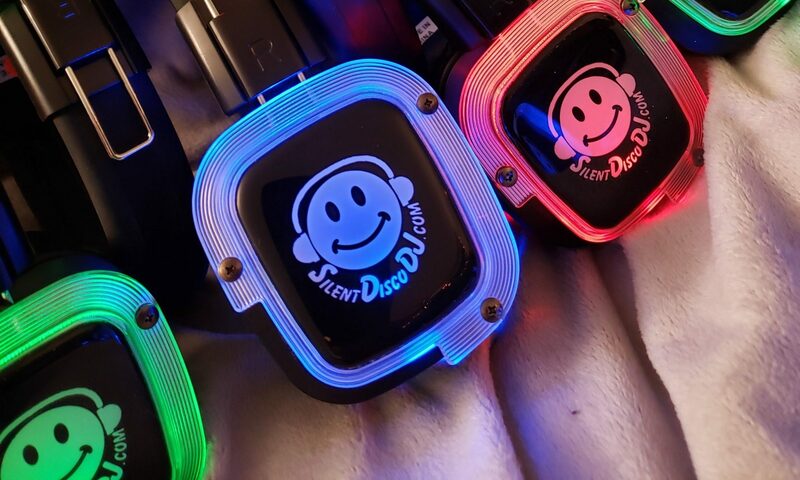 How much does it cost to rent Silent Disco headphones? We charge $7 per headphone for the first 100. For the second 100 and beyond, it is $5 per headphone. We have a 36 headphone minimum order for free shipping. We do require a security deposit which is returned to you upon safe return of our product. For more information see our pricing page. Our minimum order size for free shipping is 36 headphones. We can do smaller orders, but we raise the price to cover shipping and we add a service fee for the smaller order. I can do all major Credit Cards, PayPal, Venmo, Square, Paper Checks, the Cash App, and if you give me a few days to set it up, I can do just about whatever other payment form you need. I need your final payment to clear before I send you the headphones. I need to send you the headphones a week or so before your party so that they arrive in plenty of time for you to do a sound check. I usually recommend that full payment be made 10 days before your party. What is the security deposit cost for the headphone rental? I don’t like to call the security deposit a cost or fee because you will get the money back. Yes, you have to have the money on hand, but assuming that nothing goes wrong, I will be returning it to you. The security deposit is different depending on the size of your order. For your convenience, I have listed it below. When do you need payment of the security deposit? The security deposit must be paid with the final payment and like the final payment must be cleared before I can ship you the headphones. So if you do it through paypal, the deadline is 10 days before your party. If you are using a personal check with two weeks to clear, get it to me three and a half weeks before your party. What is the headphone shipping fee? Free! Shipping of the headphones costs you zero dollars! There is no shipping fee for you! I pay shipping for you both ways. When you get your packages, there will be a prepaid label in the sleeve under the original. You simply switch that label out. Then drop them off at your local FedEx office or contact FedEx to have them pick it up. The only thing to “set-up” is to plug in the transmitters to both electricity and your audio devices. -There are three transmitters to power, so you may want to have a power strip handy. -I supply the wires that go from your audio device to the transmitters. -All you have to do is to plug in your device and turn it on. Oh yeah, you have to make sure you turn up the volume on your device and press play. I would suggest that it will take about 5 minutes to get get everything plugged in if you don’t count opening up the boxes. It will take you longer to decide what music to play than it will to plug in the three transmitters. What devices can I plug into the transmitters? I have the transmitters ready to go with a 3.5mm jack to plug in phones, tablets and computers. If you want to plug in a mixer board, I have adapters for you to use in the outside zipper pocket of the transmitter case. There are two XLR plugs and three stereo RCA cords. That will accommodate most mixer boards. There are also two double female connectors to join those to what is already there. How loud should the volume be on my device going into the transmitter? If you are using a phone, iPad, iPod, or computer, start with all of the volumes all the way up. Next listen with the headphones and turn down the loudest device to match the volume of the other two. You want all channels transmitting approximately the same volume so that when users switch channels on the headphones, they don’t have to adjust the volume knob. If you are using a DJ mixer, they go a lot louder, so, you want to be listening in the headphones while you turn it up. Have your own headphones at about 60% volume when you do that. That way, nobody will be complaining about the headphones being too soft when they turn them to 100% volume. Where should the “off_low_high” button on the transmitter be positioned? Leave it on the “low” setting unless you have a football field sized area you are trying to fill. The “low” versus “high” refers to signal strength and not to music volume. It will not affect the music volume. Also, when it is on “high” it can cause a clicking static noise if a headphone gets too near the transmitter and all of the headphones on that channel can hear it when it happens. Only use the high setting if you are in a huge area and/or some of the guests are losing reception in their headphones. The “off” position turns the unit off, but there is no reason to do that due to how I have it set up. Simply unplug the power strip, and leave the transmitter switch on “low”.